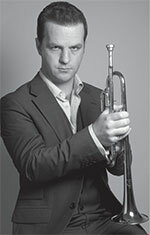 Simon Desbruslais is a British trumpet soloist, whose performances have been critically acclaimed as 'steel-lipped', 'musically compelling' and possessing 'supreme confidence and flair'. Equally active in baroque and contemporary music, Simon has recorded extensively for Signum Classics, including Psalm – Contemporary British Trumpet Concertos, an album of trumpet works written for him by John McCabe, Robert Saxton and Deborah Pritchard. Radio and television broadcasts form an integral output to Simon’s work and over the last four years he has performed live on BBC 1 television, BBC Radio 3 & 4 and German Radio SWR2 to millions of viewers and listeners worldwide. A crucial element of Simon’s career involves working with composers to create and champion new works involving the trumpet. This has ranged from chamber works, such as trumpet and piano, to full-scale concertos and more unusual combinations such as trumpet with choir, or with string quartet. Simon has a particular commitment to British music—composers who have written with his sound and technique in mind include, among others, Edwin Roxburgh, John McCabe, John Traill, Deborah Pritchard, Lola Perrin, Luke Bedford, Toby Young, Tomas Yardley and Tom Armstrong. Since his breakthrough season in 2012/13, Simon has given concerto performances in China and Brazil, appeared as soloist with Royal Northern Sinfonia, English Symphony Orchestra, BBC National Orchestra of Wales, Orchestra of the Swan, Charivari Agréable, Brook Street Band, Ensemble Diderot and London Concertante, and as a guest chamber musician with the Ligeti Quartet, Austral Harmony, Little Venice Ensemble and Ensemble Perpetuo. He has given solo performances at the Ryedale, Wymondham, Bangor New Music, North York Moors, Deal, and Rheine Vokal festivals, and appeared as a concerto soloist on the natural trumpet at the Wigmore Hall. Simon is fortunate to maintain active duo partnerships with pianist Clare Hammond and organist Stephen Farr, among many other fine musicians. Simon was educated at King’s College London and the Royal College of Music, winning numerous prizes and scholarships. He was subsequently a private student of Eric Aubier in the Conservatoire à Rayonnement Régional de Rueil-Malmaison. Keen to expand on the relationship between performance and musicology, Simon holds a doctorate from Christ Church, Oxford, on the music theory of Paul Hindemith, which will soon be published in monograph form. He is Lecturer in Music at the University of Hull, where he is also Director of Performance, and he has lectured at the universities of Bristol, Nottingham, King’s College London and Surrey. Simon acknowledges the generous support of Arts Council England, Ralph Vaughan Williams Trust, Britten Pears Foundation and Help Musicians UK.